21-year-old cellist Sang-Eun Lee has been hailed for her expressive artistry and dazzling technique. She won the 2014 Young Concert Artists International Auditions, and First Prize at the 2014 YCA Auditions in Seoul, Korea. At 15, she won First Prize at the 2009 Johansen International Competition in Washington, D.C., Second Prize at the 2009 International Tchaikovsky Competition for Young Musicians, and the Young Musician Prize of the Emanuel Feuermann Competition in Berlin. She was also awarded Germany’s Kronberg Academy Cello Festival’s 2009 Ingrid zu Solms Culture Prize. 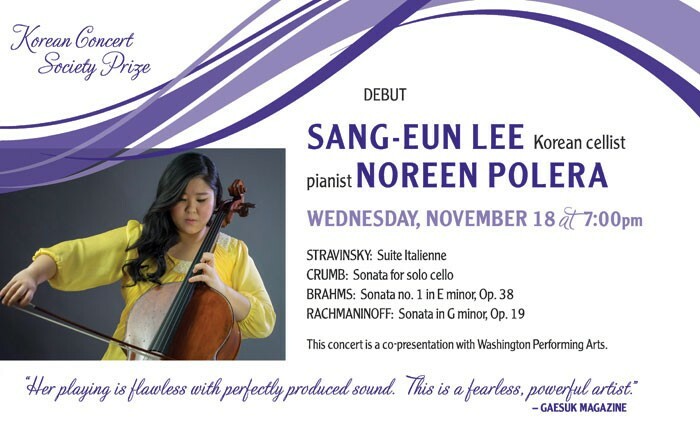 This season, Ms. Lee makes her Kennedy Center debut, co-presented with Washington Performing Arts and supported by the Korean Concert Society Prize, and her New York recital debut, sponsored by the Michaels Award. She also performs at Colgate University, Buffalo Chamber Music Society, the Paramount Theatre, the Jewish Community Alliance in Florida, the Lied Center of Kansas, and the Music@Menlo Festival. 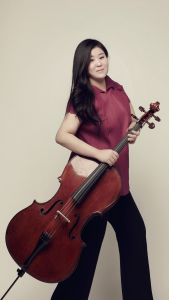 Ms. Lee has been invited to perform as a soloist with Korea’s leading orchestras including the Seoul Philharmonic under Myung-Whun Chung, the Suwon Philharmonic, the Prime Philharmonic, the Korean National University of Arts Orchestra, the Gangnam Symphony and GMMFS orchestras. She made her Seoul recital debut at the age of 13 on the Kumho Prodigy Concert Series and has given recitals at the Blue House in Seoul and the Musée du Louvre in Paris. Ms. Lee has been featured on KBS (the Korean Broadcasting System). Born in Seoul, Korea, Ms. Lee attended the Korean National University of Arts, from the age of nine, where she worked with Myung Wha Chung and Sang Min Park. She currently attends the Curtis Institute of Music, working with Peter Wiley and (YCA Alumnus) Carter Brey.